July 20, 2010, Odessa, Ont. – When Brian Burt and Alex English were looking into biomass heating systems for their greenhouses, they could not find exactly what they needed, so they re-designed an existing system from the ground up. Alex English and Brian Burt are congratulated by Northumberland-Quinte West MPP Lou Rinaldi (at right). • The potential for a byproduct that can be used to fertilize soil. • An astounding 65 per cent savings in heating costs. Instead of using 120,000 litres of heating oil a year, the owners now use 600 tons of wood construction waste, making the operation clean, green and far less expensive. 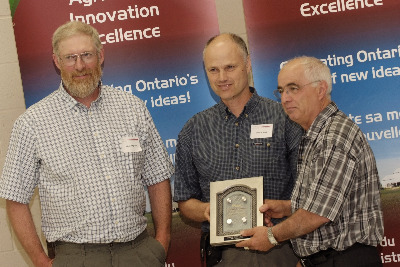 This project earned Burt’s Greenhouses one of 55 regional awards, and with it a $5,000 cash prize, in the Premier’s Award for Agri-Food Innovation Excellence program. The five-year, $2.5-million program – announced as part of the 2006 provincial budget – recognizes that farmers have always been innovative in the running of their businesses and will foster even greater innovation across the province’s agri-food sector.